Gives you a live overview of what is being showed on each Airtame when no-one is streaming including their current status. Lets you customize each Airtame Homescreen with a selection of apps and ability to edit the overlay placement, text, and color. 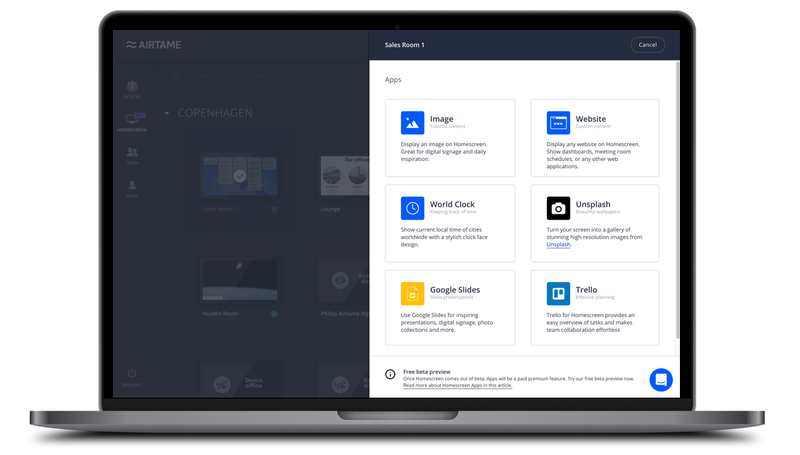 Use Airtame Cloud to easily integrate Airtame with applications such as Google Slides, Trello, and Unsplash. Learn more here. Have your device updated to firmware v3.2.3. Click on "HOMESCREEN" in the left menu bar. Select any device and click "Edit". Click "Switch app" and select your favorite app. Note: Homescreen will continue to be in public beta and unpaid at the moment, giving you the opportunity to explore these apps without additional requirements. As we develop more apps along with more features, we are planning to introduce a subscription model for premium users which will be required for gaining access to certain functionalities. Customize colors of the text and the layout background. Learn more about these options here. When this is enabled, a screenshot is sent from the Airtame device to your private Airtame Cloud account. Screenshots are only sent when the Airtame is not being used for a streaming session. If you wish to disable this function on any of your Airtame devices, simply check of the screen and go to the edit option in Airtame Homescreen. Go to the tab "TEAM"
Press "Disable Homescreen" in the upper right corner. Set orientation of your Homescreen to landscape or portrait mode (requires firmware v3.2 or newer). The orientation will only change for the background content running on the Homescreen meaning that the orientation of streaming sessions wont be adjusted. Airtame's background web browser cannot show all website content. These are the current things it does not work with. My device shows a log-in page, what can I do? Airtame does not currently support these web pages/dashboards. You will need to gain a public link or switch dashboard providers. My device says it cannot display this URL, why? Most likely it is due to the web page containing unsupported content like Java, Flash, Silverlight, or animations. The page keeps refreshing and never loads. The web page requires too much memory. Airtame has up to 150Mb of space for loading web pages. You can simplify or remove some elements and try again. The background never changes or I see "Ooops..."
Is it connected to a WiFi with internet access? A slow internet may have caused the page to "Time-out" restart the device or apply the URL again once the internet connection improves.